Did you know that almost anyone can set up a school and call it a Montessori? 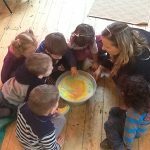 It was through helping out at a ‘Montessori’ setting which made me start training as a Montessori teacher, as I was sure that the setting was not following Montessori principles, in fact it was all a little chaotic and gave out the wrong impressions about what Montessori philosophy is all about. I was determined when I set up Steventon in 2005 that I would make becoming accredited a priority not only to give our setting credibility, but for the parents and the children too.There are around 800 ‘Montessori’ settings in the UK of which only about 170 are accredited. Our Children’s House’s in Overton and Steventon are both accredited with the ‘Montessori Evaluation and Accreditation Board’, ‘MEAB’. We are the only accredited settings in the local area, although I am aware of other local settings who call themselves Montessori. Being a Montessori accredited setting is not the same as an Ofsted ‘Outstanding’, in fact to be Montessori accredited, the setting has to be, in my eyes, a much higher quality environment for the child; and the staff more committed to learning, self-appraisal and quality improvement. The criteria for Ofsted and MEAB are very different, they have different purposes and a different emphasis. Having now experienced several Ofsted inspections and gone through the Montessori accreditation 5 times, I feel our settings made huge improvements after each accreditation process. The assessors work with the settings to look for ways to improve and make 2 visits to ensure actions have been implemented. The emphasis is on learning, improving and working together for the sake of the children. The benefits for accreditation are considerable. Below I have listed just a few. Demonstrates that the setting fulfils the criteria of a high quality Montessori provision. Demonstrates that the setting trusts and respects a child’s need to learn through freedom of choice. Reassurance that the setting is expected to have qualified Montessori teachers leading the learning. Demonstrates the setting has effective links with parents. Reassurance that the setting is expected to meet national regulatory standards. Demonstrates that the setting has a prepared learning environment that supports a child’s natural path of development. How do you know if a setting is accredited? You can follow the link on our website to read our report or I can send you a copies of our reports. We are quite excited as both our settings are soon due to be re-accredited. We not only know that we will all learn from the process, but all our children will benefit too.